Wilson Aquatic Center Named “Best Of” DC | Tenleytown, D.C.
Posted on October 17, 2013 by Tenleytown, D.C. 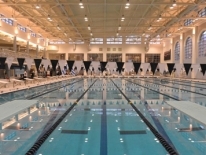 Since completion of a state of the art renovation in 2009, the Wilson Aquatic Center has been a local destination for fitness, serious swimming and family fun. The children’s pool is a particular favorite with its sloped entry and sprayers, and provides an area for recreational swimmers separate from the lap lanes of the 50 meter pool. Wilson Aquatic Center may have had some ups and downs in the last four years – air conditioning, staffing and locker room thieves – but the facility remains a treasured resource for the community. The District calls Wilson its “premier indoor aquatic center,” and for good reason: It has a 50-meter pool, whirlpool and kids’ pool, and it offers classes for kids, adults and seniors. Wilson is gratis for District residents and just $7 for visitors, and it’s open year-round. Laps are designated by speed, so novices and competitive swimmers alike can practice at their own pace. For information on hours of operation and programs at the Wilson Aquatic Center, visit the DC Department of Parks and Recreation website.